There have been 337 wild bird species recorded at the park and 120 have been known to breed here. Of those 337 many are vagrant species and not seen every year. Some of these will likely never be seen again, but over 200 species are recorded annually. A checklist of the birds of Presqu"ile can be downloaded at the end of this page. Presqu'ile's impressive bird numbers are due to its location, shape, and diversity of habitats. A great number of birds migrate annually across eastern North America. The Great Lakes are a significant barrier to migrating birds, which are reluctant to fly over open water with no place to land in an emergency. Birds therefore routinely congregate along the shore of these lakes, waiting for favourable winds to cross, if going, or resting after crossing, if coming. Presqu'ile, being situated on the shore of Lake Ontario, is already nicely situated to take advantage of this phenomenon, but it has two other things going for it as a bird and birding destination. Being a peninsula that sticks out into the lake, it is even more attractive to birds. If they are coming across the lake and they are tired it offers the first refuge they see. If going they can get an extra few kilometres start across the lake. Presqu'ile's diversity of habitats is also important. Good bird habitat means that birds can afford to land and stick around a bit as they can find food to eat and sheltered places to hide and sleep. With many different habitats the park attracts more birds, as different birds like different habitats. They can find it all at Presqu'ile. This habitat diversity is also why the number of breeding birds at Presqu'ile tops 100 species of birds annually. This combination of location, shape, and habitat diversity is also the reason why the weird birds show up here so often. Different birds may be seen at different seasons and a visit to the park anytime can be rewarding, though many consider spring migration to be the premier event. Spring migration comes in two main waves here. Peak viewing for the ducks, geese, and swans is in March as the ice retreats down Presqu'ile Bay. Returning waterfowl tend to concentrate at the ice edge and can provide good viewing at different locations in the park. It is not unusual to see 18-20 species of waterfowl on a single visit and 25+ species over the course of the month. After the ice is gone, the ducks are still around until late April but they are spread over the bay and marsh and harder to see. The exact timing of the ice retreat down the bay can vary by 2-3 weeks from year to year. The early passerines (small birds) and most waterbirds start arriving in late March; Grackles, Red-winged Blackbirds, Meadowlarks, Song Sparrows, Great Blue Herons, Caspian Terns, and 20 to 30 additional species will show up before the beginning of May. The major influx of small birds, including the warblers, tanagers, flycatchers, and shorebirds, etc. is in May. A trip here in mid-May could easily net 100 different species, and certainly counts of over 150 species a day have been obtained by some diligent and lucky bird-watchers. But any day during that month could be good with 70 to 80 species seen. The advantage of early May bird-watching is that the leaves are not out and small birds are easier to see. After the third week in May leaf-out is pretty well along everywhere in the park except right at the water?s edge, the lighthouse area remains a favourite birding location for this reason. Presqu'ile is perhaps best known for its shorebird migration. This migration is better in fall but can be quite good in spring between mid-May and early June, with several thousand birds of 10 to 15 species being seen in this period. By the time June arrives, most of the migrants are gone but Presqu'ile still supports a large diversity of breeding birds. A trip here in the summer could yield 70 to 100 species in a couple of days of looking, but birds are generally harder to find in the summer. Many small birds sing in June and if you know their songs this is the best time of year to detect breeding birds. Presqu'ile is also home to a diverse waterbird breeding colony that supports good numbers of Ring-billed Gulls, Herring Gulls, Common and Caspian Terns, Double-crested Cormorants, Great Egrets, and Black-crowned Night-Herons,. This colony is off limits to visitors during the breeding season (March 10 to September 10) to prevent disturbance to the birds but most of these species can be viewed feeding in the local area and the colony itself can be viewed from a distance from Owen Point. Fall migration is much more extended than spring migration and birds start moving south through Presqu'ile from mid-August to mid-October for the small birds and into early November for waterfowl and shorebirds. Detecting and viewing birds is more difficult in the fall as the leaves are still on the trees, the birds are not singing, and they are mostly in their more sombre non-breeding plumages, yet many birders find this season the most rewarding. One group of birds that is easier to see in the fall is the shorebirds, which are out in the open and come through in moderate numbers but great diversity from mid-August to early November. Twenty-five species of shorebirds are regularly seen here in the fall and 42 species have been recorded over the years. While birds are much reduced in numbers at Presqu'ile in the winter there are still birds to be found. Ducks of a few species overwinter as long as the water remains open and the deep water of Lake Ontario almost never freezes. 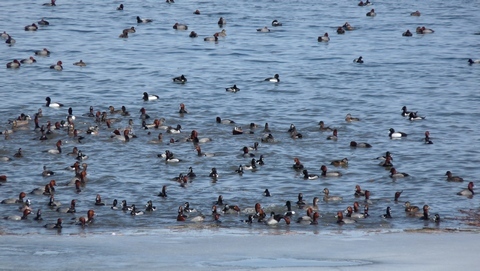 A raft of Long-tailed Ducks against the ice cliffs of the Lake Ontario shore is a spectacular sight. In addition to ducks, winter finches and northern owls also appear here from time to time, and almost anything can turn up. The Friends of Presqu'ile maintain two feeders in the park during the winter season. The Friends also sponsor the Park's Bird Sightings Board, which is operational all year. Stop and check out what?s been seen and please add your own sightings after your visit. A bird checklist and a brochure outlining the best birding areas in the park can be picked up from the Sightings Board. The brochure can also be downloaded below. Presqu'ile is fortunate in having a number of dedicated local birders constantly keeping an eye out for birds in the park and submitting and keeping the park's records. Clive Goodwin is the keeper of the Presqu'ile database. This database can be accessed at the "Birds of Northumberland" website, below. Please submit any records you have for the park to him. Doug McRae is a Presqu'ile resident that writes a weekly report on Presqu?ile birds for ONTBIRDS and a copy is presented in our Birding Reports section. The second Atlas of the Breeding Birds of Ontario, based on one of the most important bird research and conservation projects ever undertaken in the Western Hemisphere, is an essential environmental and resource management tool, helping to assess how regional and global environmental changes have affected Ontario?s bird populations historically and particularly over the 20 year period between 1981-85 and the 2001-2005. Profits from the sale of atlases will go towards bird conservation projects in Ontario and Canada. Note: Fred Helleiner, who did the bird sightings for Presqu'ile Park, was co-author for the first issue of this atlas.